How can one actor be so good and another so misguided in the same production? 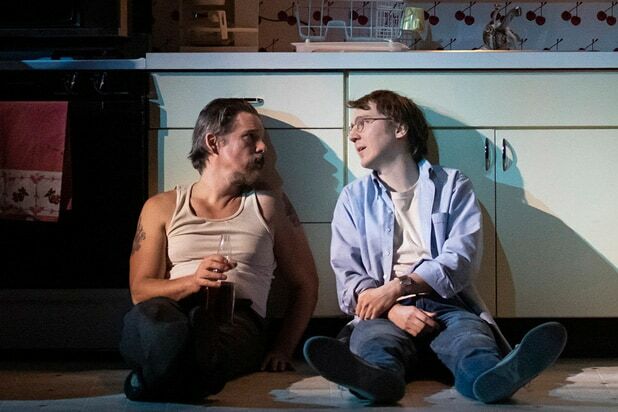 That bizarre mash-up happens in the Roundabout’s new revival of Sam Shepard’s “True West,” which opened Thursday at Broadway’s American Airlines Theatre. Indeed, how can Ethan Hawke deliver such a grandiose, inspired performance as the bad brother Lee across the stage from a wan, overly ironic performance by Paul Dano that flirts with embodying, but never grabs hold of, the good brother Austin? James Macdonald directs this very unbalanced spectacle. Hawke nails Lee. He’s the real thing even though he’s playing a great fake, a would-be cowboy who desperately hangs on to some outmoded idea of rugged individualism in a world that no longer believes in John Wayne, much less a true man of the West. Hawke is giving the performance of his stage career, an achievement made even more remarkable in light of his current film work. In “First Reformed,” he essays a man of God who’s as repressed as Lee is out of control. Dano, on the other hand, camps it up in “True West.” He’s perfectly acceptable in the first act when he’s supposed to be playing the good brother who has a family and is in the middle of what appears to be a somewhat successful filmwriting career. But nowhere in that first act does he give any glimmer of the gravitas that makes him a formidable force against Lee in the second act. Dano’s is not an incompetent performance in the vein of Madonna’s in “Speed-the-Plow” or Peter Krause’s in “After the Fall,” which also played at the Roundabout’s American Airlines Theatre. Those two actors couldn’t get beyond the basics of making us believe they were doing anything more than reading a script. Dano has mastered a low-key, naturalistic style of speaking, but Austin is anything but understated in the second act when he challenges his brother for supremacy in their mother’s house, as well as the world beyond. Dano doesn’t make a convincing drunk, which is a real problem for a role that requires his character to be totally smashed for most of the second act. But more serious is his inability to match Hawke’s energy, presence and intensity. Instead of confronting Lee, Dano’s Austin literally flounces. At the end of a line reading, he adds a silly gesture, like flicking his wrist or bumping his hips. The audience rewards him with nervous giggles. He’s playing camp while Hawke’s playing real. “True West” was last seen on Broadway in 2000 with John C. Reilly and the late Philip Seymour Hoffman. They switched lead roles throughout the run, and there was real logic to that casting legerdemain. They were clearly two bad apples who had fallen from the same tree. Hawke and Dano aren’t even distant cousins. As the two men’s mother, Marylouise Burke is much less mannered than usual, having almost if not completely retired her pixilated persona here. Gary Wilmes plays to perfection the stereotype of a Hollywood movie producer that Shepard no doubt despised. 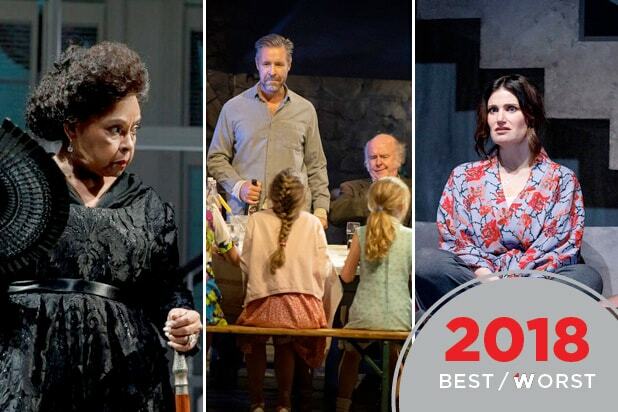 TheWrap theater critic Robert Hofler picks the best stage productions of the year. Sarah Bernhardt wants it all and gets it in Rebeck's grand comedy about the greatest feat of cross-dressing in the theater. The inescapable prison of "Waiting for Godot" is turned into a Chicago street corner that two men can't escape except through death. The author of "Jerusalem" borrows effectively from Friel, Steinbeck, Rodgers and Hammerstein, and Riverdance in his look back at a Northern Ireland that even Margaret Thatcher would applaud. How this play will perform in Ireland, if it ever gets there, is anyone's guess. Demons lurk upstairs, as well as in the basement, where an emotionally unstable man has taken up unexpected residence in his sister's house. This thriller gets scary long before you even realize it's a thriller. Young girls and one boy in a dance competition grow up but never leave their adolescence behind in this poignant comedy. There's nothing trivial about being 13 years old. In fact, there's nothing worse. Taking up temporary residence in a Queens, N.Y., basement, two generations of immigrant women learn lessons of survival and Americanization in this sweeping saga of hope and desperation. Coping with rage after her husband's dumps her for a much younger woman, a middle-aged woman finds little comfort from a father who's about to marry a much, much younger man. Arguably the most underrated new play of the year. Gabriel Garcia Lorca tangles with Charles Ludlam in this brilliant retelling of "The House of Bernard Alba," set in a New Orleans after the Louisiana Purchase. A foundling in the 18th century teaches us much about unbridled capitalism. This sprawling picaresque tale takes unexpected detours to a G8 summit as well as a sci-fi movie. The abolition of the death penalty in the U.K. doesn't prevent a retired executioner from taking one more life.